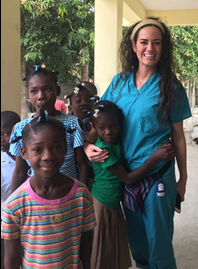 Angela Spahr (’13) recently participated in a medical mission to Haiti. She traveled with a healthcare team as part of CHAMPS: Connecting Hope and Medicine to People in Haiti. The created rural clinics and provided medical care to Haitians in Croix de Bouquet and Mirabalais. Angela raised the money she needed to participate in the mission through various approaches, to include gofundme.com. The money she raised covered her travel and lodging expenses during the trip – and allowed her to make a significant impact on the lives of many.